Small businesses run on the finest of margins. Any interruption to the day-to-day or to enterprise data security can be far more crippling for SMEs than a larger organisation. The Australian Small Business Ombudsman shows more than one in five small businesses nationwide couldn’t continue operations after the spate of Ransomware attacks in 2017. 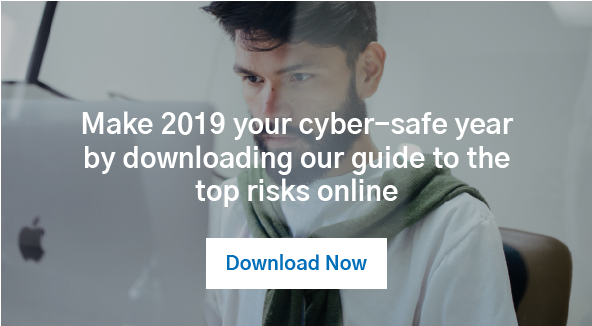 But being cyber-conscious doesn’t mean you have to invest in a truck full of expensive antivirus software – it can often just require addressing basic wireless network security risks. Here are four of the most common threats to your business’s data security. They sound bizarre, but rogue and evil twin access points are legitimate threats to your wireless network security. These malicious digital entry points are set up by hackers to gain access to your enterprise Wi-Fi. Rogue access points are tacked onto your business network, stealing sensitive information as you enter. Evil twin software is similar, but mimics the appearance of a business network, diverting victims onto a false platform. Man in the Middle attacks involve a hacker secretly intercepting communications between two parties. The individual can then pretend to be one or the other person in order to gather sensitive data. Meanwhile, both people communicating have no idea they are no longer talking directly to one another. Evil twin access points mimic the appearance and address of another network to steal sensitive data. Rogue access points can be dealt with using a wireless intrusion prevention system. These devices monitor the radio spectrums of unauthorised access points and pick up on any unusual activity. For evil twin access points, server authentication network service is the most effective means of ensuring all enterprise Wi-Fi users don’t have ill intentions. Secure Internet Mail Extensions are used to encrypt emails, ensuring only intended recipients can read them. This prevents Man in the Middle attacks from happening. When a business receives an out-of-the-box Wi-Fi network device, it comes preconfigured with its own SSID number and pre-assigned password. Many business owners make the mistake of never changing these credentials. This makes it far easier to access your business network without authorisation. Many NSW business owners also fail to add a web filter to their network, meaning employees and customers can access websites or IPs which are known to bear a security threat. Additionally, affording too many different individuals control of internet access points leaves your network vulnerable to attack when these employees move on. The first problem has any easy fix – simply ensure to change the SSID and network password information to something personal to your business. This will reduce the risk of customers and employees using dangerous access points. Adding a firewall to prevent users from accessing known problem-websites is also a must for better network security. The second issue can be rectified by employing a wireless local area network (WLAN) that’s centrally-managed. Company mobile devices, such as phones, tablets and laptops are used to access the internet and online communications platforms – many store valuable online data or access information to your enterprise Wi-Fi. If these devices become misplaced during travel or are stolen, that exposes your business to security threats. It’s essentially handing over the key to the door protecting your enterprise data and communications. A comprehensive employee departure program should ensure that all mobile devices are returned and the data wiped clean for the next user. If a device is stolen or misplaced, you should have the infrastructure in place to disconnect it automatically from your business’s wireless network. A robust security policy will help keep your enterprise safe. Your business’s mobile should be wiped clean of old data before they’re handed over to new employees. Distributed Denial of Service (DDoS) attacks are a simple way for hackers to bring down most enterprise’s internet capabilities. Every network has a limited data transfer capability – meaning a single machine can send repeated server requests to overload a business’s infrastructure and shut it down. Luckily, a DDoS attack from a single origin is relatively simple to protect against. Setting up a firewall to block the originating IP address should be enough to prevent this attack from continuing. This same principle can be used to block larger scale attacks from a malicious server. There are many wireless network security risks that could threaten the integrity of a small business’s day-to-day operations. While these common threats are reasonably easy to address, there are many others that could require the expertise of IT service providers. Biztech is an expert security and network solutions business with a focus on supporting the IT infrastructure of businesses across NSW. For more information on how we can help increase your network security, contact the team today.